I'm working on a new book, thanks largely to the hammering intensity of my novel-workshopping colleagues Corinna Chong and Alix Hawley. If a first draft's finished by the end of summer I'll put up a flashy, celebratory post; if not my face is still pressed to the keyboard. My first work for comic books! Though not writing a comic. A raucous text story will appear in the next volume of Ed Brisson's The Violent. Most important right here right now: The Spoke Literary Festival. 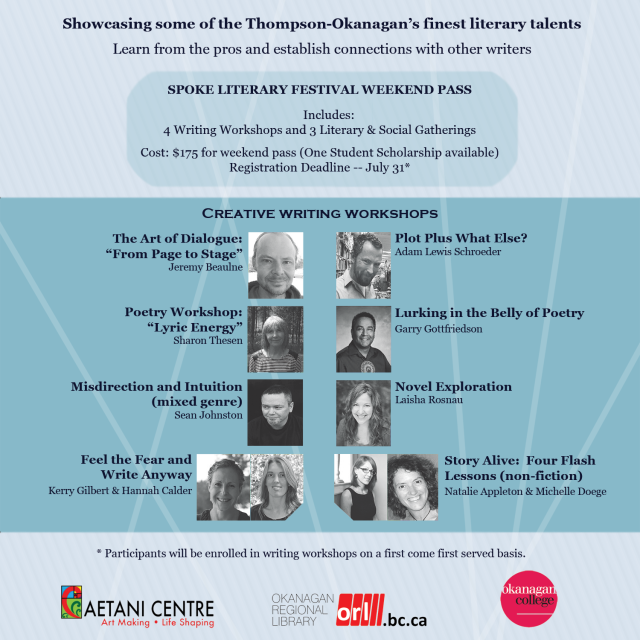 Start writing wheels rolling or get a leg up on current work, through four intensive workshops over the August 20/21 weekend in Vernon BC. Any reason not to write dispelled over two unforgettable days! The July 31 deadline is extended until the final seats have bums in them.